As an inspired correspondence, Post Script unfolds over the course of June 2018. 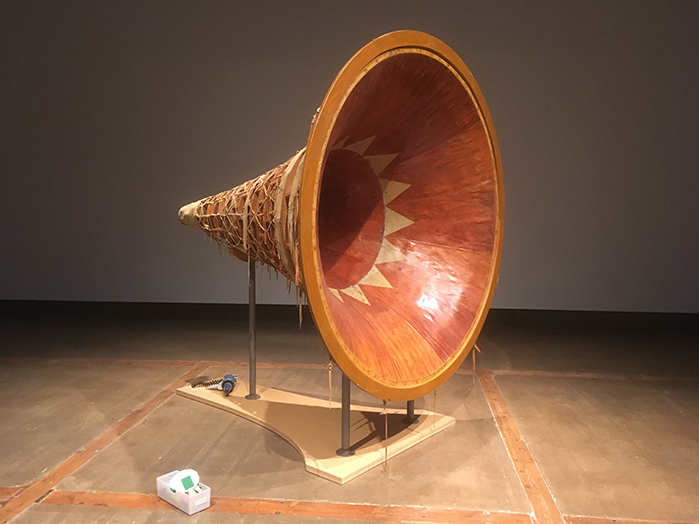 From June 1 to June 3 a single work will occupy the Main Gallery: Rebecca Belmore’s Ayum-ee-aawach Oomama-mowan: Speaking to Their Mother. Each Monday beginning June 4, another work will join the gallery, allowing a conversation to incrementally build within the space. Including new and recent work by Susan Blight, Melissa General, and Luke Parnell, Post Script continues a discussion with a particular emphasis on the inextricable link between the body, land and voice. Lisa Myers is an independent curator and artist with a keen interest in interdisciplinary collaboration. Her curatorial practice considers different kinds of value placed on elements such as time, sound, memory and knowledge. In addition to curatorial projects based in Toronto, her projects include three touring exhibitions, wnoondwaamin | we hear them (2016); Recast (2014); and Reading the Talk (2014). Myers has an MFA in Criticism and Curatorial practice from OCAD University. In addition to many exhibition publications, her writing has been published in Senses and Society, Public, C Magazine and FUSE Magazine. Myers is based in Toronto and Port Severn, Ontario and is a member of Beausoleil First Nation. She is currently an Assistant Lecturer in the Faculty of Environmental Studies at York University. Image top: Rebecca Belmore, Ayum-ee-aawach Oomama-mowan: Speaking to Their Mother, 1991. Photo: Gordon Hatt.